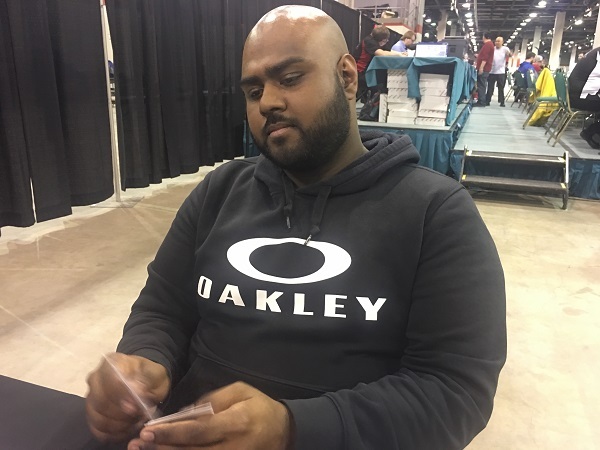 Akeem Abrahim and Chester Henson are both currently 5-0 in YCS Chicago. Abrahim is using a Trickstar Deck that includes 3 copies of Trickstar Corobane plus 3 copies of Pot of Extravagance from Savage Strike, while Henson is using a Subterror Deck that is capable of dominating a Duel with the new Savage Strike Subterror monster, Subterror Guru. 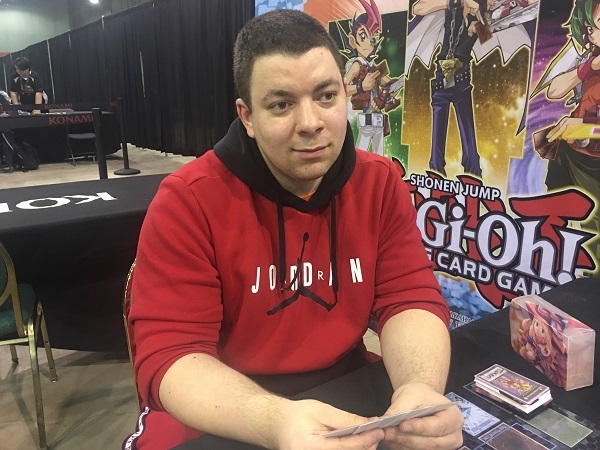 Henson is an experienced Duelist and the winner of the 2017 North America World Championship Qualifier, so his decision to use a lightly-represented Subterror Deck in the tournament should speak to how powerful he believes the Deck can be. It’s time to Duel! Henson started off Duel 1 by activating Pot of Extravagance! He randomly banished 6 cards from his Extra Deck face-down to draw 2 cards. Then, he activated Pot of Duality to reveal There Can Only Be One, Pot of Extravagance, and Called by the Grave from the top of his Deck, and added There Can Only Be One to his hand. He activated The Hidden City next, and used its effect to add Subterror Guru from his Deck to his hand. He Set Guru and then used the effect of The Hidden City to flip it face-up. He used Guru’s effect to add Subterror Final Battle to his hand. He Set 4 cards to his back row and then passed his turn. Abrahim opened up with Trickstar Lycoris, Trickstar Corobane, Trickstar Candina, Heavy Storm Duster, and Pot of Extravagance. He drew another Lycoris for his turn, and then Henson flipped Gozen Match in his Standby Phase. Abrahim Special Summoned Trickstar Corobane from his hand, and Henson flipped There Can Only Be One. Abrahim Chained the effect of Lycoris, returning Corobane to his hand and Special Summoning Lycoris to the field. He attacked the face-up Guru with Lycoris and lost 200 points of damage in the battle. He Set Heavy Storm Duster and then ended his turn. Henson drew a card and then lost 200 Life Points to the effect of Lycoris. He used another Pot of Extravagance next, banishing 6 more cards from his Extra Deck to draw 2 cards. He lost another 400 Life Points to the effect of Lycoris. Next, he used Guru’s effect, flipping Lycoris and the Guru face-down. Abrahim flipped Heavy Storm Duster, targeting Final Battle and There Can Only Be One, and Henson Chained Final Battle to prevent the effects of his Subterror monsters from being negated. Henson activated Pot of Duality next, adding Subterror Fiendess from the top of his Deck to his hand. Next, Henson Flip Summoned Guru and used its effect to add another Final Battle to his hand. He attacked Lycoris with Guru to destroy it and Set a card to his back row. Abrahim drew a card and then activated Pot of Extravagance. He banished 6 cards at random from his Extra Deck to try to draw 2 cards, but lost out to Ash Blossom & Joyous Spring. 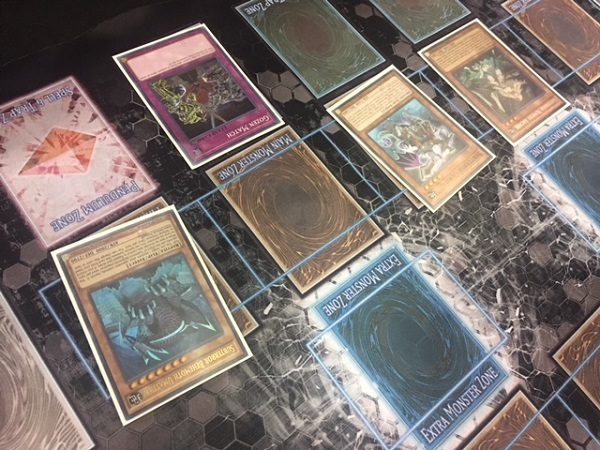 Next, Abrahim activated Trickstar Light Stage; but Henson sent Fiendess from his hand to his Graveyard to negate the activation and put Guru face-down. Abrahim Summoned Trickstar Candina next. He tried to use its effect, and when Henson flipped Infinite Impermanence to try to negate it, Abrahim Chained the effect of Lycoris in his hand to Special Summon Lycoris and return Candina to his hand. He resolved Candina’s effect to add Light Stage to his hand, and then activated it adding Trickstar Reincarnation to his hand with its effect. Next, he used Light Stage’s effect to target Henson’s face-down Subterror Final Battle, and Henson Chained it, using the effect that stops Subterror effects from being negated for the turn and then returning the Final Battle back face-down with its effect. Abrahim Set a card to his back row before passing. Henson drew a card and lost another 400 Life Points to Lycoris and Light Stage. Then he Flip Summoned Guru and used its effect to add Subterror Behemoth Umastryx to his hand, losing another 400 Life Points. Abrahim flipped Trickstar Reincarnation to try to get rid of Henson’s hand, but Henson used Ash Blossom & Joyous Spring to negate it. Henson Flipped Guru and Lycoris face-down with Guru’s effect and then Special Summoned Umastryx. He flipped it down and then used The Hidden City’s effect to flip Umastryx back face-up and activated another copy of The Hidden City to add Subterror Nemesis Archer to his hand. He Normal Summoned Nemesis Archer next, and then attacked directly with Umastryx and Nemesis Archer to drop Abrahim down to 4200 Life Points. Henson activated Final Battle next, flipping Guru into face-up Attack Position. He flipped the Final Battle back face-down and then attacked directly with Guru, dropping Abrahim down to 2600 Life Points. Abrahim drew a card and then used Light Stage’s effect to target Final Battle. Henson Chained it to Set Umastryx face-down and then return Final Battle face-down. Abrahim Summoned Candina next, and activated its effect; but Henson sent Fiendess from his hand to his Graveyard to negate the activation. He Chained Guru’s effect too, allowing him to put both of his own monsters face-down with the effects of his two cards. Henson used Heavy Storm Duster on Abrahim’s next turn, but it was irrelevant – Henson Flip Summoned his monsters and attacked with Umastryx. Abrahim banished Trickstar Reincarnation to Special Summon Lycoris from his Graveyard, and when Henson attacked Lycoris with Umastryx to destroy it, Abrahim tried to use the effect of Corobane in his hand to increase his monster’s ATK; but Henson activated the effect of Subterror Fiendess to negate the activation of Corobane and allow his monsters to press through enough damage to end the Duel! Chester Henson wins Duel 1 with Subterrors! 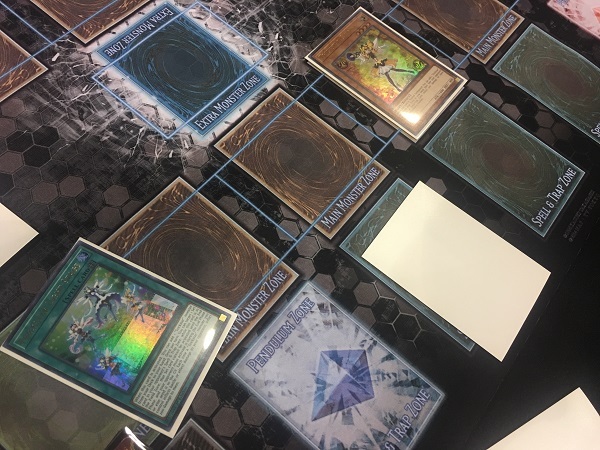 Abrahim opened up Duel 2 with Trickstar Candina, Trickstar Lycoris, Dinowrestler Pankratops, Trickstar Reincarnation, and Pot of Extravagance. He activated Pot of Extravagance, banishing 6 random cards from his Extra Deck face-down to draw Heavy Storm Duster and Ash Blossom & Joyous Spring. Next, he Normal Summoned Candina and used its effect to add Trickstar Light Stage to his hand. He activated Light Stage and used its effect to add Trickstar Corobane to his hand. He Set Heavy Storm Duster and Trickstar Reincarnation to his back row before passing his turn. Henson Normal Summoned Subterror Guru and then activated Pot of Duality. He added The Hidden City from the top of his Deck to his hand and lost 400 Life Points due to the effects of Light Stage and Candina. Next, he activated The Hidden City and tried to use its effect, but lost out to Ash Blossom & Joyous Spring. Henson lost another 400 Life Points. He used Guru’s effect next, flipping Guru and Candina face-down. Henson used The Hidden City to try to flip Guru face-up, and this time, Abrahim Chained Heavy Storm Duster to destroy it. Henson Set a card to his back row and passed. Abrahim drew Twin Twisters. He used Light Stage to target Henson’s face-down There Can Only Be One, which Henson Chained. Then, he Flip Summoned Candina and activated Twin Twisters, discarding Corobane to destroy There Can Only Be One. Next, Abrahim returned Candina to his hand to Special Summon Lycoris and Normal Summoned Candina. He tried activating its effect, but lost out to Ash Blossom & Joyous Spring. Abrahim flipped Trickstar Reincarnation next, banishing 2 cards from Henson’s hand and causing him to draw 2 more cards. Henson lost 600 more Life Points. Corobane attacked Guru, and Henson used its effect to add Subterror Fiendess to his hand, losing another 400 Life Points. Direct attacks from Candina and Lycoris dropped Henson down to 2400 Life Points. Henson drew a card, dropping down to 2000 Life Points, and then Normal Summoned Subterror Nemesis Archer. He attacked Lycoris with Nemesis Archer, destroying both monsters in battle, and then used Nemesis Archer’s effect to Special Summon Subterror Fiendess from his Deck in Defense Position. He used his Fiendess’s effect in Main Phase 2 to Set it face-down and Set Subterror Guru from his Graveyard. Then he activated the effect of Umastryx to Special Summon it from his hand in Defense Position. He Set a card to his back row and then ended his turn. Abrahim used Light Stage to pin down the card in Henson’s back row and then Special Summoned Dinowrestler Pankratops. He attacked Henson’s face-down Guru with Corobane, destroying it in battle and allowing Henson to add Subterror Final Battle from his Deck to his hand with Guru’s effect. Next, he attacked Henson’s face-down Fiendess with Pankratops to destroy it. In the End Phase, Henson’s face-down Solemn Strike was sent to the Graveyard by the effect of Light Stage. Henson activated Pot of Extravagance, banishing 6 random cards from his Extra Deck to draw 2 cards. He lost 400 Life Points due to the effects of Candina and Light Stage. Next, he used Umastryx’s effect to Set it face-down. Abrahim Chained the effect of Pankratops to try to destroy it, but Henson Chained Called by the Grave to banish Pankratops and negate its effect. Henson Flip Summoned Umastryx and used its effect to banish Corobane, and then attacked Candina to destroy it. In Main Phase 2, he Normal Summoned Fiendess and used her effect to Set it face-down and Set Guru from his Graveyard. He Set 2 cards to his back row and passed. Abrahim used his Light Stage to target one of Henson’s face-down back row cards and then Special Summoned Dinowrestler Pankratops. 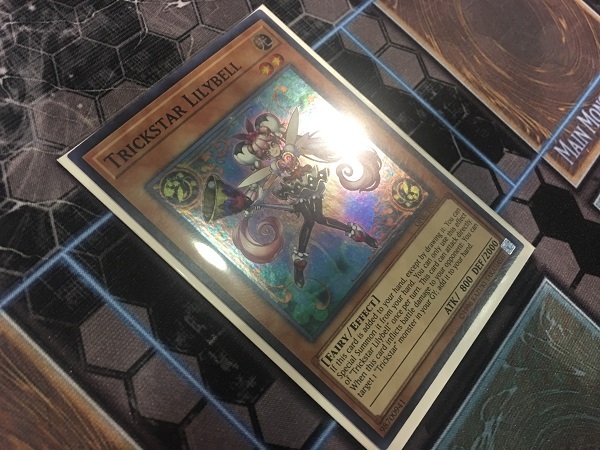 He activated another Light Stage next, and used its effect to add Trickstar Lilybell from his Deck to his hand. He used Light Stage to once again target one of Henson’s face-down back row cards, and Henson Chained the targeted Final Battle targeting Guru to try to flip it; but Abrahim Chained the effect of Pankratops to Tribute it and destroy the face-down Guru. Abrahim Normal Summoned Lilybell next, and with only 1200 Life Points remaining, Henson conceded. Lilybell was destined to attack directly, dropping Henson down to 200 Life Points, and after Lilybell’s effect would add Lycoris to his hand, Lycoris would be Special Summoned and wipe out Henson’s last 200 Life Points in his Draw Phase. Akeem Abrahim narrowly takes a victory in Duel 2, pushing the Match to a third and final Duel! Henson started off Duel 3 by activating Pot of Extravagance. He banished 6 cards from his Extra Deck face-down, but lost out on the draw to Ash Blossom & Joyous Spring! Next, Henson activated Terraforming to add The Hidden City to his hand and used its effect to add Subterror Guru to his hand. He Set the Guru and then tried to use The Hidden City to flip it face-up, but lost out to Ghost Ogre & Snow Rabbit, which destroyed The Hidden City! He Set 3 cards to his back row and then passed his turn. Abrahim drew Ghost Ogre & Snow Rabbit and then had Heavy Storm Duster, Trickstar Corobane, Pot of Extravagance, and Ghost Ogre & Snow Rabbit in his hand. He used Pot of Extravagance to draw another Corobane and a Twin Twisters by banishing 6 cards from his Extra Deck and then Special Summoned Corobane. Henson activated There Can Only Be One and then Corobane attacked Henson’s face-down Guru. In the Damage Step, Henson flipped Final Battle to increase his monster’s Defense Points by 1600, allowing it to survive the battle and costing Abrahim 1400 Life Points. Final Battle returned face-down. Henson added Fiendess to his hand with Guru’s effect. Abrahim Set Duster and Twisters to his back row before passing. Henson switched Guru into Attack Position and then attacked Corobane and used Final Battle in the Damage Step to gain ATK. Abrahim used the effect of the Corobane in his hand to try to win the battle instead, and Henson sent Fiendess from his hand to his Graveyard to flip Guru back face-down while trying to stop Corobane’s effect. Henson Set 2 more cards to the back row, and when Abrahim flipped Heavy Storm Duster, Henson Chained Solemn Judgment! But Abrahim just flipped Twin Twisters next, destroying Henson’s 2 face-down cards! Abrahim attacked and destroyed Henson’s face-down Guru, and he used its effect to add a Fiendess to his hand. Henson Normal Summoned Fiendess and activated its effect; but Abrahim used the effect of Ghost Ogre & Snow Rabbit to destroy it! Abrahim drew Terraforming! He activated it to add Light Stage to his hand then used Light Stage to add Candina to his hand. He attacked with Corobane to drop Henson down to 1800 Life Points. Henson Set a card to his back row and Set a monster. Abrahim used Light Stage’s effect to target Henson’s back row card and then attacked Nemesis Archer to destroy it in battle. Henson Set Subterror Guru from his Deck with Nemesis Archer’s effect, and Abrahim Set a card to his back row before passing. In the End Phase, Henson’s Solemn Strike was sent to the Graveyard. Henson Flip Summoned Guru and used its effect to add Umastryx to his hand. He used Guru’s effect to flip both monsters on the field face-down and then Special Summoned Umastryx. Later in the turn, he attacked with Umastryx to destroy Corobane, and at the end of the Battle Phase, Abrahim flipped Evenly Match. Henson chose to banish Umastryx. Abrahim Summoned Candina and used its effect to add Trickstar Reincarnation to his hand, and then Set the Reincarnation to his back row. Time in the round was called in Henson’s next Main Phase, and with Henson down 6600 Life Points to 1800 Life Points, Abrahim was declared the winner at the end of the Main Phase. Akeem Abrahim advances with a 5-0 record using his Trickstar Deck!